Were Ancient Malta Temples Built By Giants? Malta, an island archipelago located in the Mediterranean Sea just off the Italian island of Sicily, is best known for its many ruins of temples, believed to be among the oldest standing stone structures in the world. More than 50 temples are found on the three islands of Malta, some of them believed to have been erected an estimated 7,000 to 8,000 years ago. All are constructed in a basic design with a central walkway, some small chambers on the sides and an altar at the end. Archaeological research has turned up bones, pottery and numerous figurines and statues. Many of the statues depict a fat woman believed to symbolize a goddess of fertility. A great mystery surrounds one ancient temple, discovered deep underground by construction workers in 1902. This temple, known as the Hypogeum of Hal Saflieni, contains the "Oracle Room," where any sound is clearly heard throughout the Hypogeum. The acoustic properties suggest that the structure was designed and built by an advanced civilization. There is no knowledge of the people who lived on Malta or who built the many temples, or why they were erected. Archaeologists have theorized that blood sacrifices may have been made on the temple altars and that they were used as ceremonial places for a type of polytheistic religion. 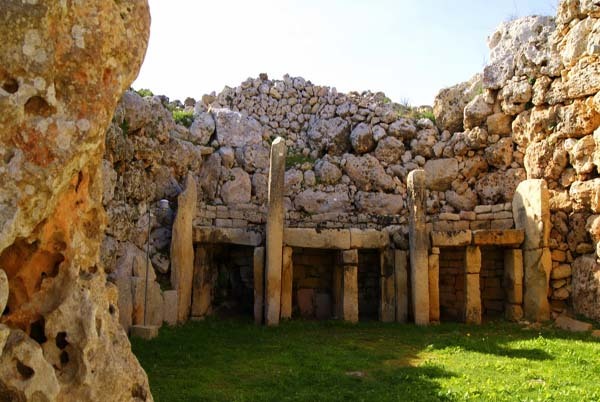 Two megalithic temples on the island of Gozo are believed to also be among the oldest. They also are perhaps the largest and most complete structures on the archipelago. They have been dubbed temples of Ggantija, a reference to giants, since the stones used in the construction are massive and considered impossible for normal sized people to have cut and moved into place. Researchers estimate that more than 2,000 tons of stone had to be removed to allow for the the Hypogeum of Hal Saflieni to have been constructed completely underground. Its walls are decorated in different patterns of red ocher. The walls are decorated with spirals, pentagons, floral designs and the outline of a bull. Within the Hypogeum were found an estimated 7,000 skeletons in a huge pile. And they were not normal human skeletons. They had elongated skulls. One skull lacked the usual joining median found along the top of the human skull. Similar skulls were discovered in the ancient ruins of Egypt and South America. Some Egyptian artwork depicts people with elongated heads. Were these people from an ancient civilization? Were they the Anunnacki, a race of giants that came from the stars that allegedly used DNA splicing with Earth humanoids to launch the human race on Earth? Some of the unusual skulls went on display in the Archaeological Museum in Valletta. But when researchers went to the museum in 1985 to study the skulls, they had disappeared. There was no record of where they went and who took them. Anthropologist Sasha Alex Lessin, whose website claims to have a detailed record of information found inscribed on the clay tablets of Mesopotamia, writes on his website that the Hypogeum dates back to the time of a great disaster that swept the area. The record suggests that it was a major volcanic eruption that killed the Minoan hegemony in the Eastern Mediterranean. The skeletons were the remains of individuals whose bodies washed ashore at Malta after the tragedy. Lessin noted that the skeletons were long-headed. He wrote that the temple also included the statue of a grey alien. A report in the Italian magazine HERA, by Vittorio Di Casare and Adriano Forgione, zeroed in on the unusual skeletal remains found in the Malta temple. The article said the skulls were removed from the Valletta museum in 1985 and "placed in the deposits. From then, they were not to be seen by the public. Only the photographs taken by the Maltese researcher Dr. Anton Mifsud and his colleague, Dr. Charles Savona Ventura, remained to testify the existence of the skulls and prove their abnormality. The article said the skulls were all found in the Hal Saflienti hypogeum "where a sacred well was dedicated to the Mother Goddess and where also the small statue of a sleeping goddess was found, associated to a relic with a snake inscription on it." The writers said the one odd skull, with a pronounced dolichocephalous, or long posterior part of the skullcap, also was photographed and appeared in a book written by Mifsud and Ventura. After Malta's megalithic history ended, Di Casare and Forgione wrote that the Phoenicians were the next people to occupy the islands. They too erected temples to the Mother Goddess in Malta. She was a snake-faced goddess named Astarte.